October 17, 1993. It’s another of those dark days in music history that, to cheaply quote F.D.R., “will live in infamy.” It was perhaps a few days later that a diffident 17-year-old metalhead was sitting in his Colorado bedroom listening to 105.9 KPBI, “Rocks The Rockies.” Between songs the D.J. announced a quick news blurb: 30-year-old Savatage guitarist Criss Oliva has just been killed in a car accident by a drunk driver. Oliva’s wife, Dawn, was seriously injured. I sat there dumbfounded, devastated that one of my favorite guitarists from one of the best, most unsung bands in the world was suddenly gone. It had only been a few weeks since the Tampa-based progressive/melodic metallers had performed in Denver. However, it being an 18-and-up show and me being underage, I was S.O.L. on seeing my beloved Savatage until their next visit. They had been supporting their latest and most successful release, the brilliant Edge of Thorns platter, the album that had defined and consumed my soul for months on end. No, it wasn’t my first exposure to Savatage; that was 1991’s Streets and 1987’s Hall of the Mountain King albums, and their classic Gutter Ballet (1989) followed closely behind in my stereo. But an email and penpal friend of mine (thanks again, Julie!) who worked at a music store (remember those things?) got an advance copy of EOT and sent me a taped copy of it. I was immediately, permanently hooked months before I got a chance to buy my own copy. What was so great about EOT? Where shall I begin? How about the crunchy riffs and fiery, blues-influenced soul shredding of Criss. Or the clean and gutsy mid-ranged power belting of new singer Zak Stevens, replacing Criss’ brother and long-time musical partner Jon Oliva. But mainly it’s about the amazing songs on this, my favorite of Savatage’s diverse and excellent catalog. 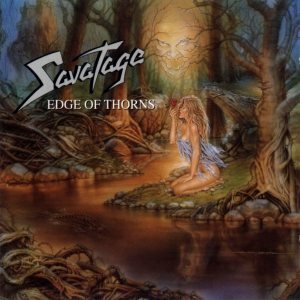 From the precise and heavy palm-muted riffing, to mellow cleanly arpeggiated accompaniment and acoustic passages, to Jon Oliva’s beautiful piano work, EOT took Savatage’s previous prog-metal formula and strengthened it. Savatage joined the big leagues on this album, with the dynamic songs becoming the soundtrack to many (I’m sure) an angst-ridden high schooler’s life. This record spoke to me more than any other, at the time of release, than any other of my all-time-favorite list. It was as if producer Paul O’Neill and the Olivas had written this recorded exactly for the forgotten, confused, depressed or misguided young people, as if it were the Beatles crooning all over again, “Hey, look at all the lonely people.” The iconic title track, with the eerie piano intro and mid-paced slicing main riff, sings of a romance as futile and fleeting as it was unforgettable, “But I don’t think about you anymore?” Oh really; then why are you singing about it, eh? Another plaintive, mid-tempo track lamenting a lost lover, “Conversation Piece,” relates how a “picture on a shelf is good for conversation over a cup of tea.” The gorgeous and melancholy piano-based ballad, “All That I Bleed,” stayed on infinite repeat on my CD player for a long time. Here Stevens plaintively croons about receiving a heartfelt letter at the end of a long-distance love affair. “All the things we keep inside/All the things that really matter/The face puts on its best disguise/All is well/Until the heart betrays.” Then that monstrous rhythm guitar enters in that magnificent chorus: “Lord Bring on the night/Wrap it all around me/Let it hold me tight/soak up all that I Bleed.” This song features one of Criss’ most moving solos, and it’s still one of the most beautiful songs I’ve ever heard. Then there’s “Sleep,” the somber acoustic closer that’s almost taciturn in its longing, “Hey there you/way out there could you show me/just a signal/or a sign/that after all these years/that you know me/and I’m not just killing time.” Whether the narrator is yearning for God or a lost lover, this song is a perfect conclusion to a masterpiece of musical equilibrium. “Exit Music,” the haunting three-minute piano instrumental, works as a fitting swansong and tribute to Criss. P.S. Just a few years later, Jon Oliva, Paul O’Neill, Stevens and a host of others debuted a little side project called Trans-Siberian Orchestra. But that’s another tale for some other day. ~ by jonnyboyrocker on July 24, 2010.